from the nato's: heather's bee shower. and shower boots. heather's bee shower. and shower boots. heather is one of my good friends. 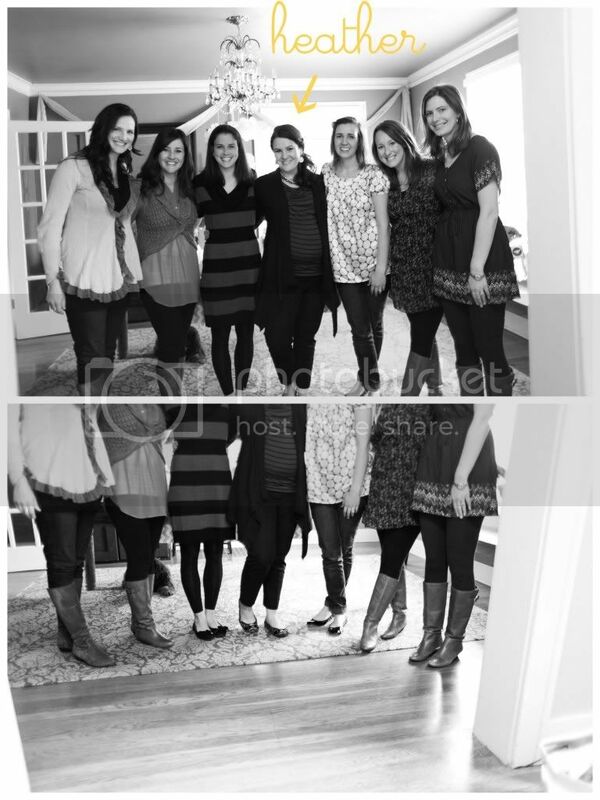 what makes this shower, like, super wonderful is that heather waited a long time to have a baby. not on purpose. they tried to have a baby. couldn't. then adopted a sweet girl 4 years ago, took a break, then started some treatments after that. it didn't work. they tried and waited and tried and waited and it wasn't working. but this one awesome time, it did work. and so we celebrate. heather will bring a baby boy into the world very soon. and he will BEE very loved. did you even see that transition, people? can you BEE-lieve that awesome pun? first, meet heather and all the lovely hostesssssessssess for this wonderful occasion. and also, they are all basically wearing the same boots. these are called "shower boots". you must wear them to showers and stuff. as the title suggests. ok, not really... but they should be called that. actually, i decree this now. on the interwebs. SHOWER BOOTS. NNN-EEEE-WAYS, let's talk about a bee themed shower, shall we? the fabric for the tablecloths is michael miller fabric. grey and yellow polka dots and yellow and white chevron. i made these POM balls, have you heard of them? SLOL(seriously laughed out loud). ok, a little over done, but have you seen POM bee puffs? i think not. i added some wings and a stinger and called them bees...and they became bees, because, again...i hath decreed it on the interwebs. 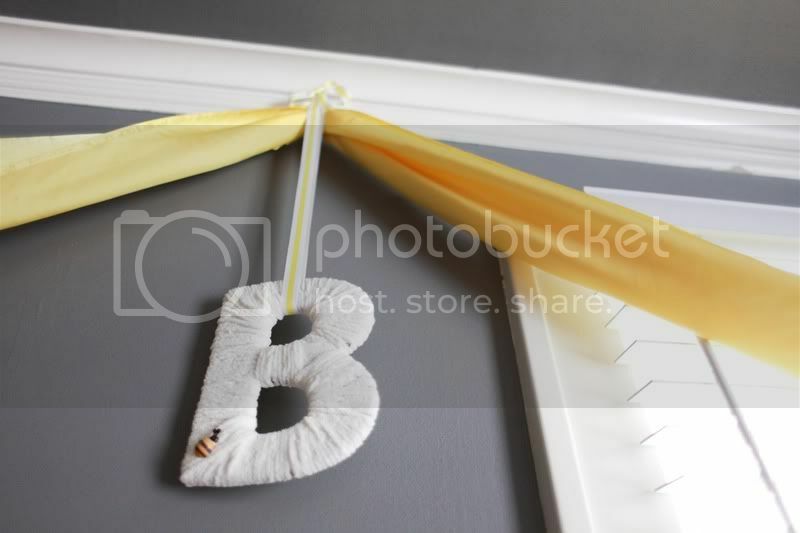 a sweet yarn wrapped letter B.
and B for first letter of her babers name. the stars collided and we picked the perfect B(ee) theme! someone tell me what these flowers are called? they are dried, yellow, beautiful things and i don't know the name of them. and yes those are shower curtains in the entry. thank you jessie for not taking baths. and i did make nato put paper on the water bottles with me. but don't tell anyone i told you that. also, i felt like my plates on the wall were out of character for the theme. OH NO. not on my watch. so i just traced the plates with paper, cut them out, and put them right over the plate. of course i stamped them...because...well, i love stamps. buy them when you see them on sale. do this or we can't be friends. i mean, how cute is this banner that Kristin F made? in a world where pennants are over done, this banner is such a great change. 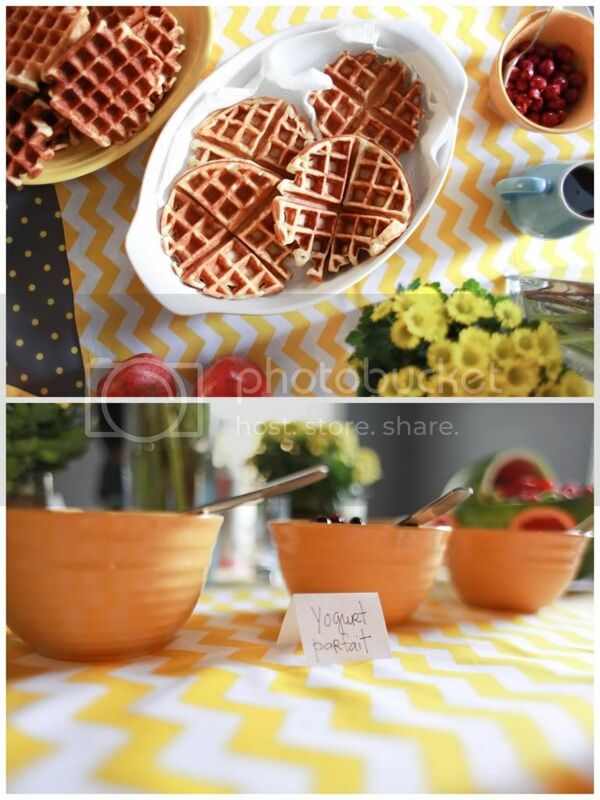 a waffles bar(waffles were gluten and dairy free) and INSANEly delicious. my mother is genius. fruit: a baby carriage fruit situation! so cute. kristen L, you rocked this. and we also had egg casseroles but i didn't take pictures of them because... i mean, who even likes eggs? ok, everyone...including me. i just forgot. deal with it. sorry kristin L and F.
and for party favors, i made chapstick. what? you think that's crazy. well it's not. you can make your own on the cheap. and i shall blog this later and you will snort with delight because it's so easy. thanks christine for meticulously cutting out bees while our kids watched shows. i mean, played educational games while praying. 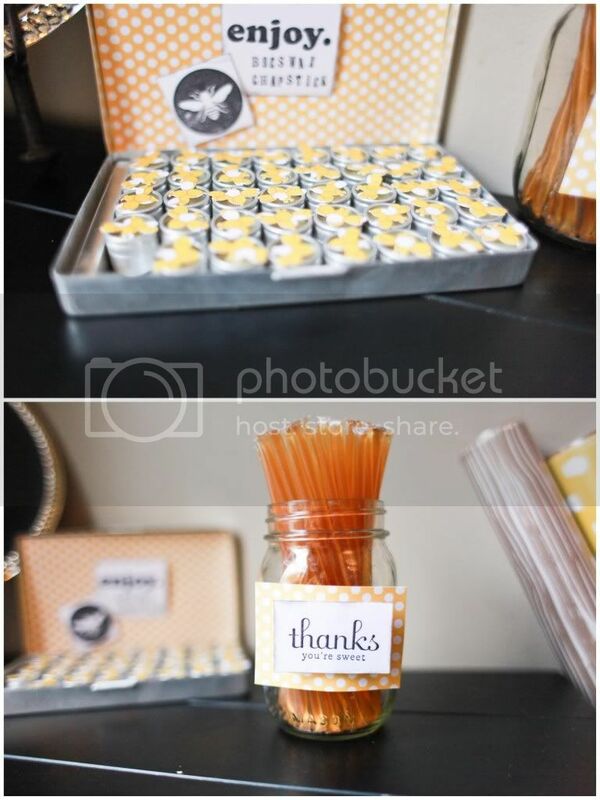 we also gave honey sticks for favors. apparently people eat these at farmers markets and fairs...i have never had one. still won't. listen, if i'm going to eat sugar it's obviously going to be in the form off a cinnamon roll or snickers bar. Its the cutest shower ever! Thanks for lettin us take a peek! Billie Balls :)You are welcome. This was Beeelightful! ... Yes that is now a word. I look forward to seeing/using your chapstick tutorial since I live off of that stuff half the year and my toddler ruins most of it. Also, can we get your mama's waffle recipe? Gluten and dairy free yet delicious sounds too good to be true. A little bit sorry you don't have some shower boots. 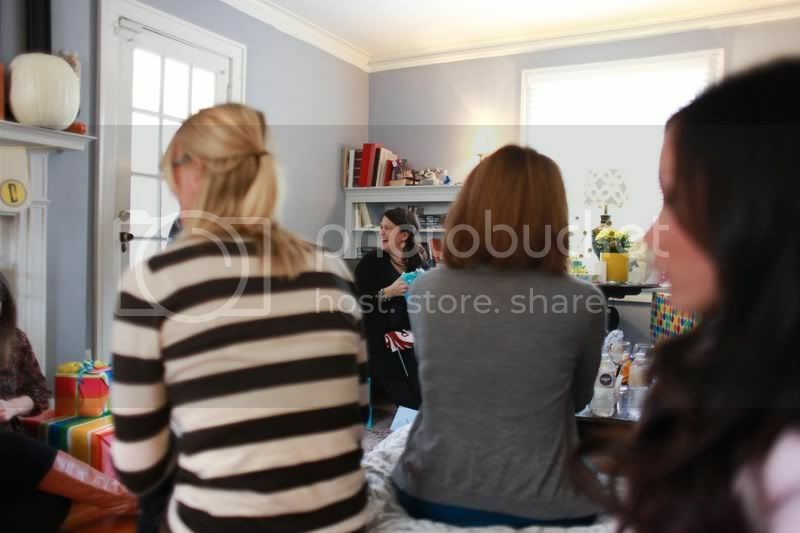 And I LOVE bee baby showers. SO much that I had one for my friend Kate. The yellow flowers are called Billy Bobs....at least that is their 'casual name'! you throw the best parties! Love this! you always have the cutest parties. maybe you should be a party planner...just sayin! Okay if she hates dogs then I love her. A lot. NO YOU DID NOT TURN A WATERMELON INTO A BABY CARRIAGE!! Amazing. I BEE-seech you to teach me your shower-planning ways! What a beautiful shower!! But the question on all of our minds is: where do you get the "shower boots" everyone was wearing because they are CUTE!! Also, loved your Pom Bee Puffs! Way to put a spin on the pom pom! Love it! CUH-YUTE party theme! You throw the best parties. Seriously. And congrats to your friend. How wonderful for her. please come plan my baby shower. thanks. please start doing this for a living. seriously such a cute idea. 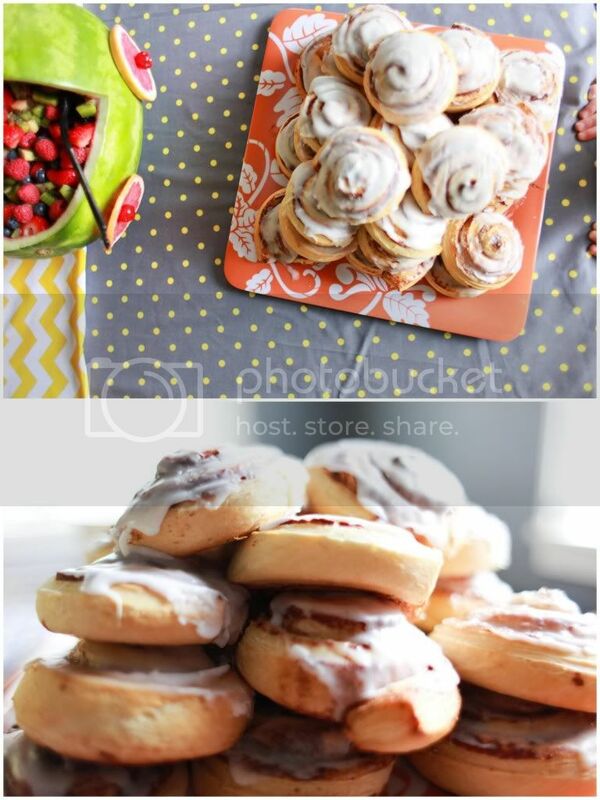 Now I want a cinnamon roll! 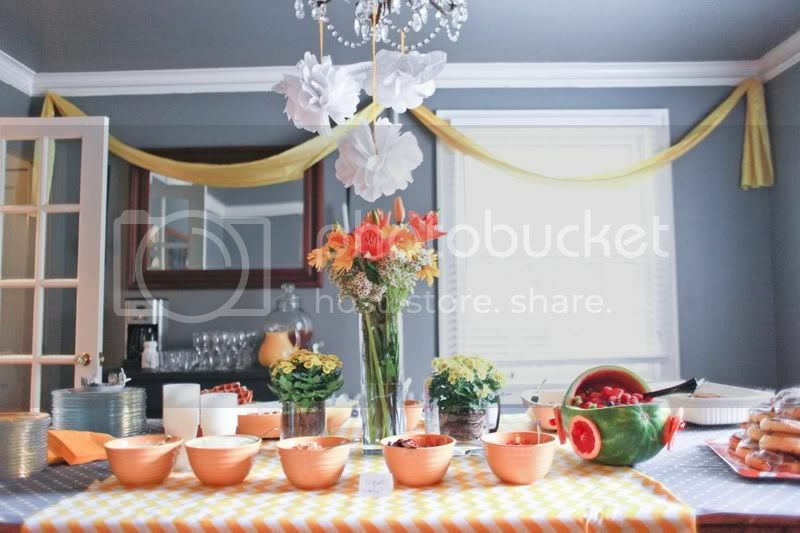 you should be seriously become a professional party planner. for reals. one of your funniest posts lady. thanks for making me laugh. I like want to invent a word for your type of humor...think something that combines the words...sarcasm and wit....and me laughing really hard. I got nothing. Yay for baby Boyd!!!!! As Heather's oldest childhood friend, like from birth :), I am sooooo happy for her! 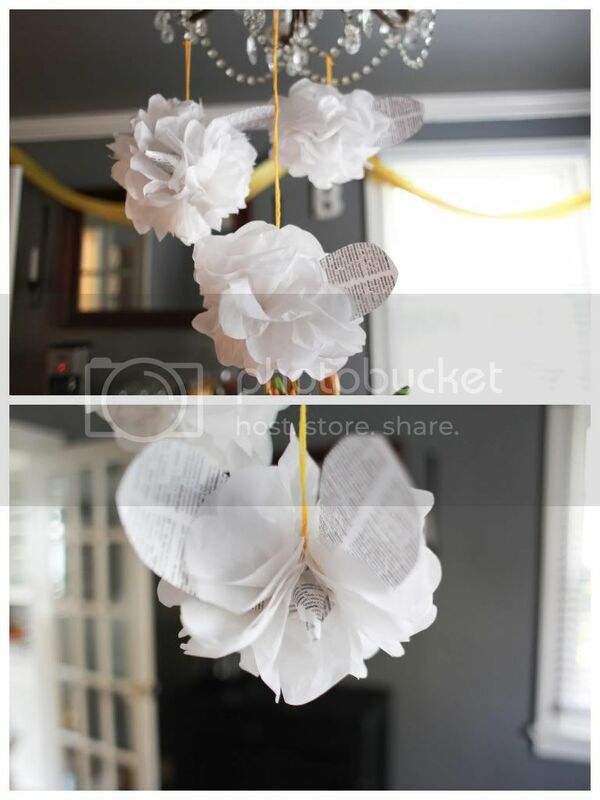 Love, love, love the Bee theme! You'll have to have her tell you our "baby bee" story. Or maybe she already did. I heart bees!! I heart Heather! I heart her family! 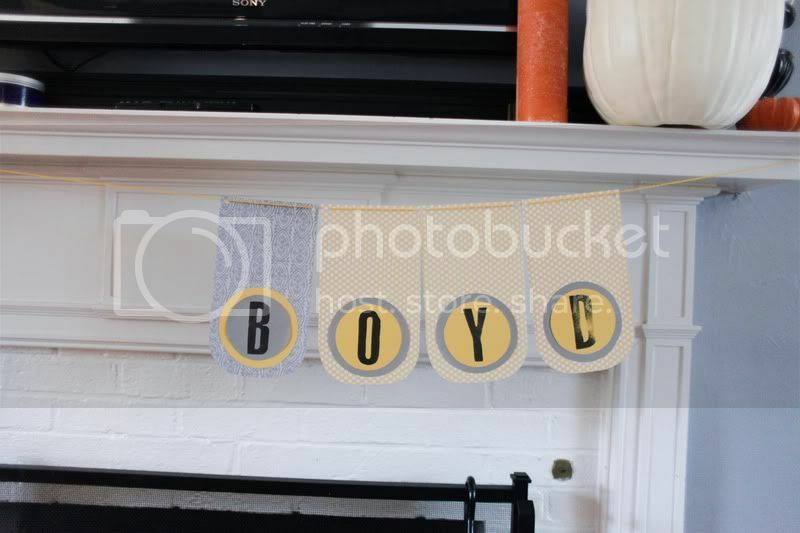 And I already heart baby Boyd! Cute, cute shower!! And I really dig your blog, too! It was truly a wonderful occasion. Thanks for hosting Jami. Your house is gorgeous, the details to die for and the lip balm is already working on my chapped lips. Thanks for including me and for sharing on your blog. So cute!! Once again, best party hostess ever. Ok, you are a party planning fool. I'm honestly jealous of how many opportunities you have to throw a party! :) I'm like trying to think of things to have parties over...like...the season fall. ;) This is adorable, as usual, and her story makes the celebration so special. I seriously love all of your parties. And your blog. You make me laugh so hard. They're called Billy Buttons! My best friend got married last January and she used those as her bouquet. I took them home, dried the stems and almost a year later, they are still beautiful. Hang on to them! Ahhhh! I need the recipe. Pronto. I just had to go gluten free for at least nine months. Possibly longer. For the love of carbs I need waffles! ps. adorable shower. beeutiful really. 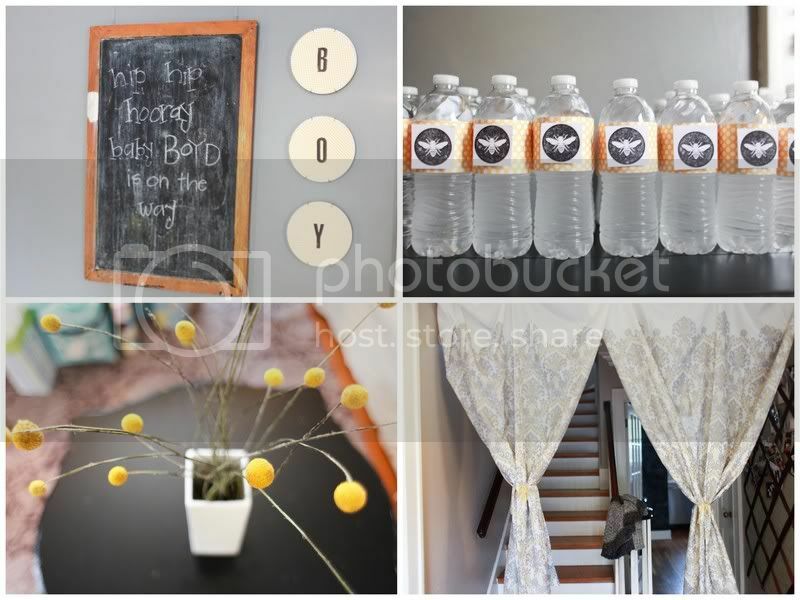 you girls know how to throw a BEE-utiful shower for the BEE-utiful momma! 1. where is your cute dotty shirt from? 2. I'm so glad to find another mom whose kids pray while playing educational games. kindred spirits, I tell ya. girl, you throw amazing showers. and what is this like the 12th once since you had penelope? you are a machine! ps. i have that shirt and i love it. 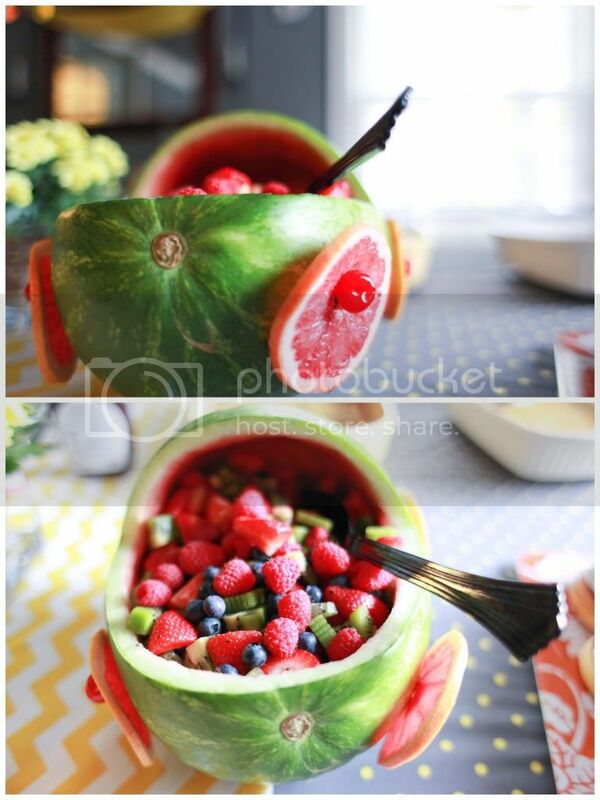 And that watermelon turned baby carriage is over the top adorable! How freaking cute is this shower! Makes me want to have a baby! Speaking of which... I held Penelope in RedeemerKids on Sunday and she is just one of the sweetest babies ever! oh my gosh! i LOVE this theme!! the shower was SOOO BEEutiful!! hey, remember that time you made chapstick for shower favors? that was ridic. Craspedia, aka billy balls, aka billy buttons, aka billy bobs. Cute little guys. Adorable shower! emily, i got the shirt from a garage sale. but it's merona! how did i miss it when it was at target. anyway, the shirt is yellow and grey. i matched the theme, which is embarrassing. or is it awesome? martha---you need to do this as a job--serious! you rock~ love it all! Haha, I totally used to have that same shirt! Well, not the ACTUAL same one...but then I got rid of it because the arms were too tight. My name is Lindi of Love The Day, a party and entertainment blog. I found this darling party on Pinterest and would LOVE to share this and some of your other celebrations on my blog. You have a great sense of style and I love your work. Please let me know if that is something you are interested in! hey jami.. just found you from.. well, i can't remember where.. but just wanted to say hi. your blog has made me laugh a lot, and also nod my head in agreement and appreciation with your openness and honesty. i especially liked this line that i just read..
i love how you shed light on the "should-y" kinds of things that all of us moms might be unnecessarily hard on ourselves for. it made me laugh out loud, and i've got a love for any blog that can do that for me.